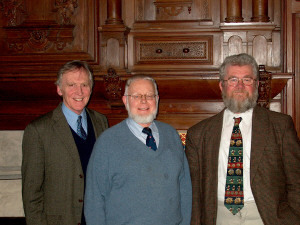 In March 2003 I was the moderator of our church's presbytery at an historic meeting in the birthplace of Presbyterianism's Westminster Confession. In this room of Westminster Abbey our Presbyterian confessionai standard's were formulated in the 1640's. On the left is Ranald Macaulay, son in law of the late Francis Schaeffer and one of the first two elders in our congregation from 1969. In the centre is Joe Martin who also served our Ealing church as an elder. The room is now the dining room of the Dean of Westminster, by whose kind permission we met there. The chamber was also the room in which Henry IV died in 1413. So in this room, Henry V became king.. He was the victor at Agincourt two years later, The statues are those of the two kings. The chamber is alongside the main door of the abbey seen here through the window. Did our framers of the confession over 360 years ago ever think that brothers from Romania and Korea would be meeting there also?